Several qualitative factors should also be taken into consideration when determining the sample size, The statistically determined sample size is the net or final sample size sample remaining after eliminating potential respondents who do not qualify or who do not complete the interview. Depending on incidence and completion rates, the size of the initial sample may have 10 be much larger, In commercial marketing research, limits on time, money, and expert resources can exert an overriding influence on sample size determination. In the department store project, the sample size was determined based on these considerations. 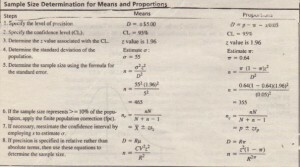 is based on the construction of confidence intervals around sample means or proportions. 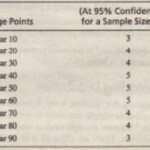 The confidence interval approach to sample size determination is based on the construction of confidence intervals around the sample mean or proportion using the standard error formula, This was illustrated in the opening Bicycling magazine example where the sampling errors were related to the sample size and to the confidence level, As another example suppose that a researcher has taken a simple random sample of 300 households to estimate the monthly expenses for department store shopping and found that the mean household monthly expense for the sample is $182, Past studies indicate that the population standard deviation a can be assumed to be $55. Thus the 95 percent confidence interval ranges from $175.77 to $188.23. The probability of finding the true population mean to be between $175.77 and $188.23 is 95 percent. The approach used here to construct a confidence interval can be adapted to determine the sample size that will result in a desired confidence interval,” Suppose the researcher wants to estimate the monthly household expense for department store shopping more precisely so that the estimate will be within ±$5.00 of the true population value. What should be the size of the sample? The following steps, summarized in Table 12.2, will lead to an answer. 1. Specify the level of precision. This is the maximum permissible difference (D) between the sample mean and the population mean, In our example, D = ±$5.00. 2. Specify the level of confidence. Suppose that a 95 percent confidence level is desired. 3. Determine the z value associated with the confidence level using Table 2 in the Appendix of Statistical Tables. For a 95 percent confidence level, the probability that the population mean will fall outside one end of the interval is 0.025(0.0512). The associated z value is 1.96. 4. Determine the standard deviation of the population. 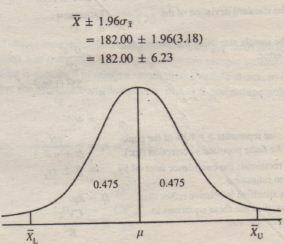 The standard deviation of the population may be known from secondary sources, If not, it might be estimated by conducting a pilot study, Alternatively, it might be estimated on the basis of the researcher’s judgment, For example, the range of a normally distributed variable is approximately equal to plus or minus three standard deviations, and one can thus estimate the standard deviation by dividing the range by 6. The researcher can often estimate the range based on knowledge of the phenomenon. 5. Determine the sample size using the formula for the standard error of the mean. It can be seen from the formula for sample size that sample size increases with an increase in the population variability, degree of confidence. and the precision level required of the estimate. Because the sample size is directly proportional to the larger the population variability, the larger the sample size Likewise a higher degree of confidence implies a larger value of z, and thus a larger sample size. Both and appear in the numerator, Greater precision means a smaller value of D, and thus a larger sample size because D appears in the denominator. 7. 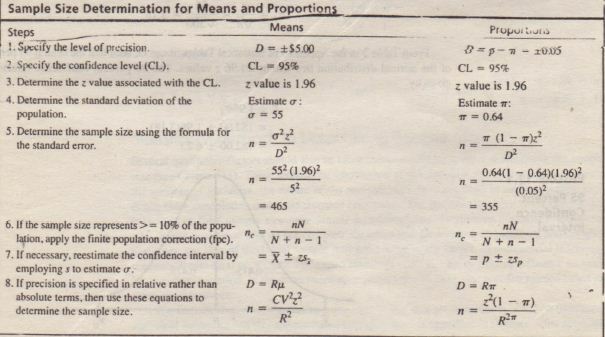 If the population standard deviation is unknown and an estimate is used, it should be re-estimated once the sample has been drawn, The sample standard deviation is Use as an estimate of a revised confidence interval should then be calculated to determine the precision level actually obtained. Note that the confidence interval obtained is narrower than planned, because the population standard deviation was overestimated, as judged by the sample standard deviation. where the coefficient of variation would have to be estimated. The population size, N, does not directly affect the size of the sample, except when the finite population correction factor has to be applied, Although this may be counter-intuitive, upon reflection it makes sense, For example, if all the population elements are identical on the characteristics of interest, then a sample size of 1 will be sufficient to estimate the mean perfectly, This is true whether there are 50, 500. 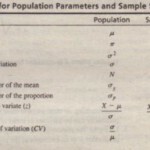 5.000. or 50.000 elements in the population, What directly affects the sample size is the variability of the characteristic in the population, This variability enters into the sample size calculation by way of population variance or sample variance, Also note that the larger the sample size, the more accurate the parameter estimation (sample mean), i.e the smaller the precision level (error) for a given level of confidence, This can be seen from the formula in step 5, A larger sample will also result in a narrower confidence interval, This can be seen from the formula for the confidence interval in step 7. If the statistic of interest is a proportion, rather than a mean, the approach to sample size determination is similar, Suppose that the researcher is interested in estimating the proportion of households possessing a department store credit card, The following steps, should be followed. 1. Specify the level of precision. 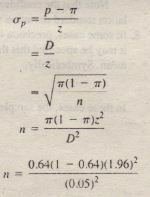 Suppose the desired precision is such that the allowable interval is set as D = P – π = ±0.05. 3. Determine the z value associated with the confidence level, As explained in the case of estimating the mean. this will be ;:= 1.96. 4. Estimate the population proportion π As explained earlier, the population proportion may be estimated from secondary sources, estimated from a pilot study, or based on the judgment of the researcher. Suppose that, based on secondary data. the researcher estimates that 64 percent of the households in the target population possess a department store credit card. Hence π = O.M. 5. Determine the sample size using the formula for the standard error of the proportion. which is wider than that specified. This could be attributed to the fact that the sample standard deviation based on p = 0.55 was larger than the estimate of the population standard deviation based on π= 0.64. The city of Los Angeles, California, hired Price Water house Coopers (PWC) to evaluate customer demand for non-emergency city services and investigate customer services usage patterns, The goal was to implement a new system that would alleviate some of the strain on the city’s 911 phone system, A telephone survey of 1800 randomly selected Los Angeles City residents was conducted. The random digit dialing telephone survey was stratified into two groups of 900 each: city resident customers who had contacted the city for service in the past six months and a group of other residents, the sample size was determined by using a 95 percent confidence interval and a margin of error of 3.5 percent. At this confidence level. one would expect that if all the residents of Los Angeles were asked the same survey, that responses to the survey would change no more than 103.5 percent, To confirm that the sample size of 900 was adequate. calculations for sample size determination by proportions were made as follows. using the maximum possible population variation (π = 0.5). The precision of D in this study is 0.035 for a 95 percent confidence level. Therefore. the 900 sample size was more than sufficient. Findings from the telephone survey revealed that the Department of Water and Power, the Sanitation Bureau, the Bureau of Parking Violations, and the Police Department received about one-half of the city’s non-emergency customer contact volume, The main method of contacting the city was by phone, which accounted for about 74 percent of the contacts, compared to 18 percent who made personal visits, Despite high Internet usage rates in Los Angeles. very few residents accessed city services through the Web, By Web enabling many of the city’s services, there was a potential for large cost savings by reducing the call volume and improving customer service. The survey also identified specific services and functionality residents would like to see available online, Therefore the city of Los Angeles launched a 311/internet customer service to alleviate some of the strain on the city’s 911 phone system, As of 2009 this service had become popular, handling a large share of the city’s non-emergency customer contacts. There are a number of Web sites on the Internet that offer free use of sample size and confidence interval calculators, for example, Survey System You can use this calculator to determine how many people you need to interview in order to get results that reflect the target population as precisely as needed, You can also find the level of precision you have in an existing sample, The Discovery Research Group also has a sample size calculator. Skiing is a popular winter sport in the United States. Conduct an Internet search using a search engine and your library’s online database to obtain information on the proportion of people who ski every season. 2. In a survey of the general population on skiing, what should he the sample size for a 95 percent confidence level and a 5 percent precision level Use the estimate of the population proportion that you determined in step 1.